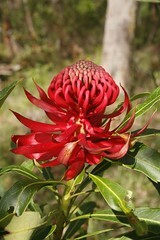 This beautiful waratah - the only one that flowers in our garden but has done so every year - is for Debbie, even though she's on the other side of the planet. She has lost someone so precious to her that there are no words or wails that can express the grief and pain of it. I can't imagine what she's going through, and I don't want to. But it's enough to send that jolt through you to remind you that nothing is forever, everything changes, and every single minute with those you love is precious.